100% soft cotton flannelette with a classic printed outer. Velcro closures - no pins! Fold back laundry tabs to prevent velcro snagging in the wash. Trim fitting design with elastic in the legs and waistband to help provide a leakproof fit. Made with boil-proof elastic which is safe to use in antibacterial soakers and clothes dryers. Fits from newborn to toddler. Fold out soaker allows nappy to be washed thoroughly and provides quicker drying times both on the line or in the dryer. Zappies must be washed at least once before use to maximise absorbency. Anti-bacterial soakers can be used, but do not use chlorine bleaches. Always flush solids before soaking. Fold the Celcro® on the waistband wings in on itself to help protect it from lint. Peg the Zappy up by the front flap as it will dry faster and take up less clothesline space. Don't dry them outside if the temperature is less than 0º Celsius. This may affect the elastic. Zappies are clothes dryer safe and fluff up so they are ready to use. Please be aware fitted nappies require a cover over the top to make them waterproof. I've used Zappy Nappy's on all our three children. So they last well,they are only starting to wear a little after almost 5 years of constant use....but, the absorbency remains the same. I use the ecobot overnap on these naps, and have experienced minimal seepage/leakage. These have been perfect for both my boys and my daughter. I use the Imse Vimse disposable liners in them, which means if they're only wet the liner can be washed and re-used a couple of times. Do I love these nappies- Yes,I do! So easy to use. I start my babies in cloth from about two weeks on (approx 4kg baby by then) and use right up until toilet trained. They fit perfectly throughout the stages of lying, crawling, walking, running...So quick and easy to put on, too! 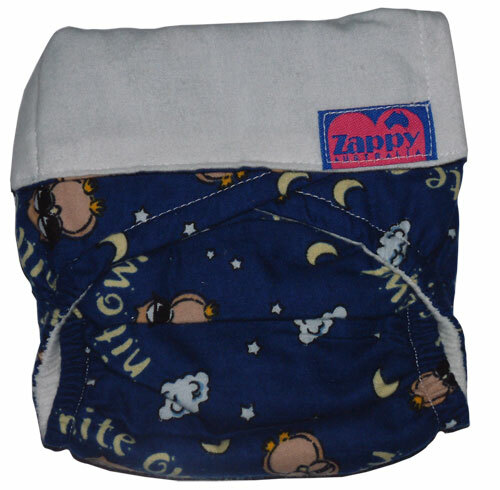 Click the button below to add the Zappy Nappy to your wish list.